I found a button in the washer and sure enough it fell off a pair of my favorite pants. I'm not very skilled at sewing, but I know this is an easy repair so I thought I'd try it. I used a pre-threaded needle kit from a drug store which only cost a couple dollars. This is convenient if you don't have a sewing kit handy and will be good for several repairs. If you have lost the button you can find a suitable replacement at a craft store. The kit I bought also comes with a couple shirt-style buttons. 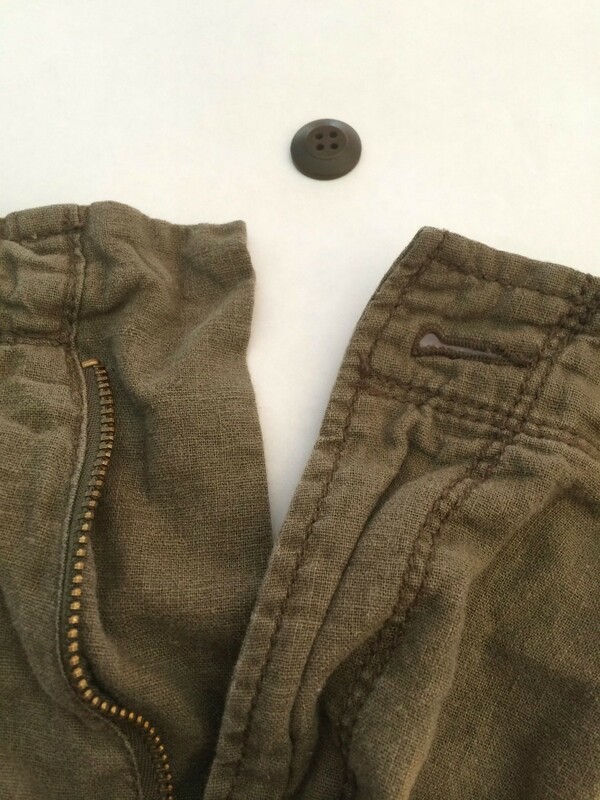 Many pants and shirts have an extra button sewed into them. Look along the bottom hem of a shirt or along the waistline of your pants. Assemble your supplies. I used the green thread from my pre-threaded needle kit and the button I found in the wash.
Start by tying a knot in the end of the string. I had to triple knot mine. Pull it through from the front where you want the button to be placed and make a small stitch. Then, cross that stitch by going back through to make a little X. You will end up with the thread back on the front of the pants. 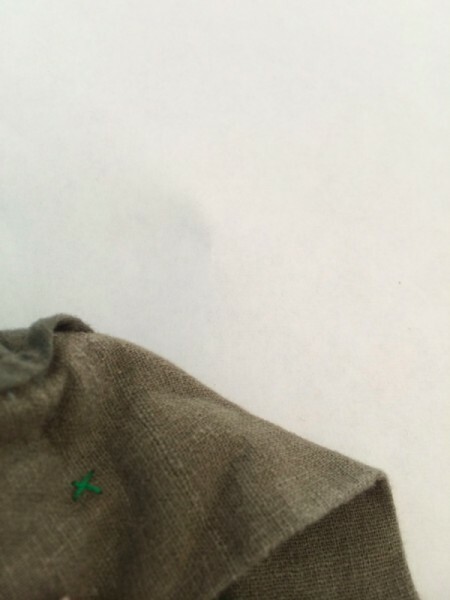 Run the needle through one of the holes on the button and snug the button down right over where you made the X. You'll use another needle or a toothpick as a spacer to give your button a little slack. Push the needle back through the adjacent button hole and insert the spacer before the loop closes up. Gently pull the thread tight. Continue with the other two button holes. Stab the needle back up through the next button hole, over the spacer, and back down through the final button hole. Repeat three or four times going around the button coming up and down through adjacent holes. Take out the spacer. The needle should be on the back of the fabric. Push it through to the front, but not through a button hole. Instead, aim it out to the side of the button. The slack created by the (now removed) spacer helps here. Wrap the thread around the threads that hold the button in place three or four times to cinch them into a bundle. Then stab back through to the back of the fabric. Tie off the thread on the back of the project. Simply push the needle under one of the thread loops laying on the fabric and then through the loop created. When you pull it tight the knot will snug up against the fabric. Do this two or three times. Trim off the excess string on the front and back of the fabric. Here is the completed button. It should be just as strong as the original.